We’re wrapping up our time here in Port Aransas. It’s passed quickly. We’ve met a lot of great people in this park, and we’re looking forward to seeing them down the road soon. While we can count on both hands the number of warm, sunny, calm days we’ve had here, it’s been fun to hang by the beach for awhile. We’re not complaining, though. It’s been lots warmer here than in Kansas City every single day. Even during the heaviest rain and wildest winds we’ve experienced here, we were thankful the temperatures weren’t in the single digits and there was no snow on the ground. 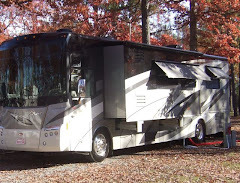 The sight of the month was the buzz of the RV park. Like an old-fashioned game of "post office" neighbors told neighbors of an extraordinary event just up the beach. When we heard the word, we joined the steady stream of sightseers to lay our eyes on a 40-foot whale that had washed ashore. Officials from the nearby University of Texas Marine Science Institute worked among the shutter-happy tourists to determine what caused the demise of the rare-in-these-parts Baleen whale. Port Aransas city staffers used heavy equipment to drag the beast to a massive crevice they carved out of the sand dunes. This would be the whale's final resting place. Of all the things we imagined we might see in our travels, attending a whale funeral never made the list! After seeing officials from the place, we spent one particularly windy and rainy afternoon visiting the University of Texas Marine Science Institute, which is located on a northernmost point of Mustang Island. We watched a movie about the earth’s forests, which wasn’t exactly what we thought we’d see at a marine institute! We expected to see aquariums, and there were a few. 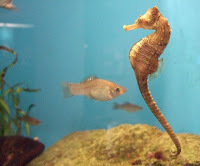 This seahorse was the star of one of the tanks. 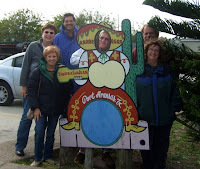 Our time in Port Aransas also provided us with a chance to meet up with virtual friends and make new ones. Fellow travelers Eric and Karla introduced us to their friends Sharon and Sherry and Al and Priscilla. After a fun lunch at San Juan, several of us posed at the restaurant’s cheesy photo-op spot. It’s been awhile since I’ve been in a quilt store. (Really!) 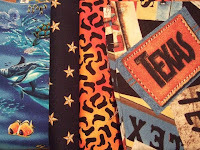 I discovered a sweet little shop in Port Aransas and found these fabrics to represent Texas in our some-day quilt. With dolphins, stars, cowboy boots and Texas signs, these four choices might not exactly go together. But, that's Texas! As we wrap up our first month as Winter Texans, we’re looking forward to heading south in search of warmer weather. We’ll find it, eventually. 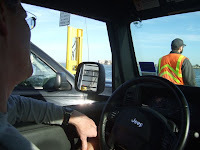 During our stay in Port Aransas we made several ferry trips across the water, through Aransas Pass to Rockport. We say “through” Aransas Pass because, basically, there’s nothing to do there. But, about 10 miles north the town of Rockport has a bit more to offer. Ask around for recommendations for a place to eat in these parts and chances are you’ll hear about four places: Alice Faye’s On The Bay, The Big Fisherman, China-A or Charlotte Plummers. We didn’t make it to Charlotte’s, but did dine at the other three. That’s Alice’s place above. 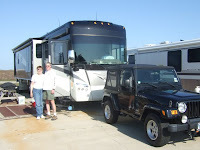 We dropped in one afternoon after checking out a few of Rockport’s gazillion RV parks. Alice offered up great water views, a tasty po’boy sandwich and sweet potato fries that were sweet, indeed. Fans of The Big Fisherman fall into two camps: those who think Tuesday is the only day to go there; or those who dine there any day but Tuesday. We got a taste of both camps when we met fellow travelers Doug and JoAnn there for lunch on a Friday. They described how they quite accidently paid their first visit to the place on Tuesday, and discovered how residents and visitors to the Coastal Bend flock for the Tuesday $1.95 all-you-can-eat lunch special. What a mob scene! We were all happy to enjoy our $5.95 single plate special on a very calm Friday. Everything was fried. So, of course, it was tasty. Typically, we don’t do buffets. But, we made an exception and joined a group of Port Aransas friends for a trip to China-A Buffet. Acres of steam tables were home to everything from kung-po chicken to lasagna to sushi. There are three reasons we don’t do buffets: First, all of that stuff doesn’t hold up long on a steam table. Two, call me a germophobe, but I don’t like the idea of touching the same 20 serving spoons that 200 of my fellow dinners have had their grimy hands on. Finally, when you spread all that food out in front of us we just have to have a taste of everything. As a result, we tend to eat way too much! China-A filled the bill on all points. But, we had a fun night with our friends. Our best dining experience in Rockport, hands down, was at the home of new friends Steve and Debbie. This evening they hosted a pig roast on a night that was perfect for eating tasty pork and sides under the stars by a campfire. What a treat. Another visit to Rockport included a stop at the Piecemakers By The Bay quilt show at Rockport-Fulton High School. Among the 50 or so quilts on display, this was one of our favorites. 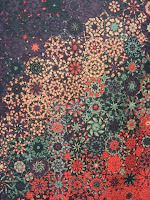 It’s called “Everchanging” and is cut from just one piece of fabric with amazing results. The show was big enough to provide welcome inspiration for more projects to put my growing fabric stash to work, and small enough to do in about an hour. That was perfect for us both. That, in a nut shell, is Rockport. If you like to hang out in an RV park, eat or catch the occasional quilt show, this place is for you. We headed south down the island today and then inland to Corpus Christi, the closest place around here that has everything you need. Known as the Sparkling City By The Sea, it may be. We wouldn’t know. Today Corpus reminded us of the City By The Bay. Like San Francisco, it was socked in with fog. This was a second trip to Corpus. The first trip entailed errands and a quick lunch. We had hoped to do some sightseeing today, but the weather wasn’t cooperating. So, we decided to have another quick lunch at the same place: Whataburger. Whataburger is a privately-held regional fast food restaurant that serves up great tasting burgers with a smile. It started nearly 50 years ago with one restaurant here in Corpus Christi. Today there are 700 restaurants in 10 states. Most of these tasty places are right here in Texas. After helping us through the many options that would make our cheeseburgers just the way we like them, the cheerful man behind the counter looked at Paul’s Kansas Jayhawks t-shirt. “Bet you don’t get Whataburger at home,” he smiled. We nodded and explained that this was actually our first time at Whataburger. He seemed genuinely excited about making our experience a good one. “Will you let us know how you like it?” he asked. We assured him we would. With that we filled our drinks, took a seat and checked out the place. It was sparkling clean and had a good “vibe”. Minutes later another cheerful soul brought our food out on one tray and a selection of condiments and other necessities on another. It all smelled so good we couldn’t wait to dig in. Actually, we didn’t. For the next several minutes we ate silently. It was that good! While we chomped away on our tasty lunch, our happy order taker strolled our way. “We’ll, how do you like it?” he asked. We couldn’t speak. Our mouths were full. We gave him a couple of big thumbs up. On our way out he thanked us for coming. We assured him we’d be back. Back on the island, Whataburger came up as a topic of conversation over breakfast. We learned a bit about the company’s history and that the flagship restaurant - a salute to the first “shack” - is located on Shoreline Avenue in downtown Corpus Christi. We just had to go back. Today was the day. These enthusiastic Whataburger converts were on a mission to burger Mecca. As we drove along the shore of Corpus Christi’s supposedly scenic harbor, we were disappointed that the fog and wind obscured the view. Corpus looks like it’s probably a very pretty, albeit windy, city. As we came closer to downtown we spotted the day glo orange on the roof of Whataburger By The Bay, the crown jewel of our latest obsession. Once again we stepped inside and were greeted by cheerful and helpful folks. After placing our order, we were encouraged to go upstairs. 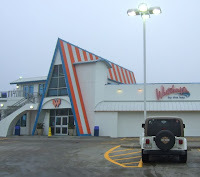 Little did we know this is the only Whataburger with a second story. It was designed to showcase the scenic views of the Corpus harbor. Though we couldn’t appreciate the views today, we definitely appreciated our second Whataburger experience. This place is doing something right. Great people providing great service and great food at a great price. We don’t know how they do it, but we’re glad they do. Some call Whataburger “A Texas Treasure”. We call it one great find.